For a recap, do visit Part One and Part Two. Aleister Crowley later sold Boleskine House and it subsequently had a series of private owners including, in the 1970s, Led Zeppelin guitarist and Crowley fanatic Jimmy Page. Visitors to the estate have reported seeing lights flashing on and off by themselves, windows shattering and a chair which belonged to Crowley moving on its own. In 1960 the then owner of the house, Major Edward Grant, shot himself in the bedroom which had been used by Crowley for some of his satanic rituals. Even today the property retains a slightly sinister atmosphere. To many modern occultists the geographical and spiritual significance of Boleskine remains extremely important. In fact, practitioners of Thelema, Crowley’s religious philosophy, are still instructed to ‘turn and face Boleskine’ when conducting certain magical ceremonies. Locally I have heard many stories from many people. I know people who have actually been to the house to attend parties that were held there and many of them have spoke of an oppressive atmosphere, strange haunting sounds and the feeling of being followed and watched. One story that I have heard locally from a few different sources is of some strange monkey type beast with red eyes that hangs around the vicinity of Boleskine House and follows people. Apart from it being a somewhat disturbing experience I have also heard that the people who experienced being followed in this way had a definite feeling that the creature was unable to harm them. This story it seems is only a local story as I have found no mention of it anywhere on the internet. However there may be some kind of possible truth in it. When Crowley eventually left Boleskine he put a sign up outside that said something along the lines of “Don’t be afraid of the beast, it can’t bite”, the locals at the time were rumoured to have said that although it may not be able to bite it is able to scare the living daylights out of you. Another local story involves two divers who were diving in Loch Ness. The story goes that two perfectly sane and accomplished divers went under the water and came up several minutes later not so sane. Allegedly they had looks of sheer terror, were unable to speak anything comprehensible and spent the rest of their days in a mental asylum. A lot of these stories may be taken with a pinch of salt depending upon your views, but there is no doubt in the fact that Loch Ness itself has attracted a lot of attention over the years mostly concerning the Loch Ness Monster. We even built a whole tourism industry from such attention, but there are many Lochs in Scotland that don’t have such attention but for some reason Loch Ness does. Perhaps. I’ve never witnessed a ghost but I know many people who are convinced that they have. If it were true that ghosts did exist then it would seem entirely plausible that the Loch Ness Monster could fit the bill. It would certainly explain the unfortunate fate of the two divers who went mad and it would certainly explain the numerous supernatural like sightings that have occurred over the years while any proof of an actual physical monster has remained elusive. 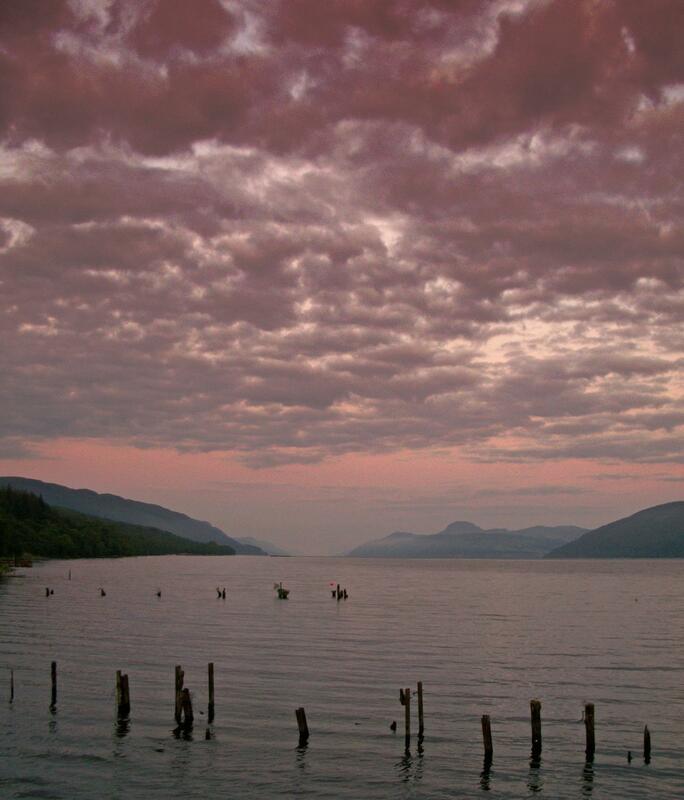 If there was some kind of entity within Loch Ness I would definitely be inclined to think that it were some kind of ghost as opposed to an actual monster. However implausible you may think that both possibilities sound; I’m sure that most would agree that the ghost theory is more plausible. I have subsequently found many other such theories that the Loch Ness Monster may be a supernatural entity and it is true that the number of sightings started escalating around the time that Crowley inhabited Boleskine House. Crowley himself died penniless in 1947 but the years have not erased the memories of his association with the Scottish Highlands home. Finally, I will finish with a photo. My friends son and his friends who are all 15 to 16 years old decided for some strange reason of curiosity to go and ‘play’ in the grounds of Boleskine House one night last year. Upon hearing this everyone told them that they were without doubt extremely foolish and implored them not to go there again. They themselves spoke of strange happenings such as the feeling of being followed and strange shifting of the apparent landscape every time they turned round. They also took a photo which is displayed below. A photo that sent a shiver down the spine of everyone who looked at it including myself. 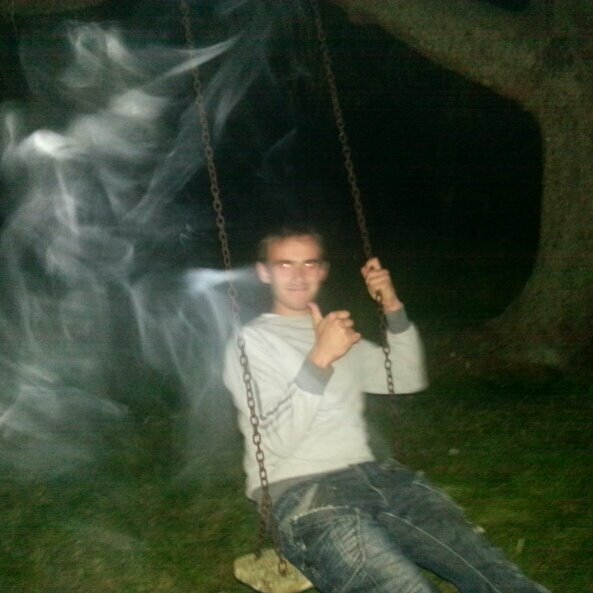 I’m sure that the strange apparition that appears in the photo can be explained rationally, it could possibly be that the person taking the photo was smoking a cigarette and that the apparition is actually smoke. I’d rather believe that because the alternative is a little bit too scary to comprehend. Mark putting up his gang signs! If you ever do visit Loch Ness you will no doubt like millions of others be hoping for a glimpse of the legendary Loch Ness Monster. If I were you I would just appreciate the immense beauty that lies there. If I were you I would be praying that the Loch Ness Monster does not show itself to you. That’s what I do whenever I go to Loch Ness, some monsters are better left alone. Make sure to look at more of Mark’s work and his stunning photos at I’m Gonna Study the Rain and if you’re lucky, he’ll take you on a story adventure as well. Next I am speaking the Kween’s Anglish! The imagination is extremely powerful and I am sure that people, particularly those with weak hearts have literally frightened themselves to death by genuinely believing they had experienced paranormal happenings. I remember, as a child thinking that I had seen a figure dressed in light clothing at the foot of my bed. The ghost? quickly vanished. I had just awoken and my vision is, in any case extremely poor so the most likely explanation is that the phantom was a mere trick of the light, however I can not categorically deny the existence of things which go bump in the night. I have been half frightened to death when awaking from deep sleep to be confronted by my bedroom door slowly opening but it is, of course only my four-legged friend Trigger which in the confusion of awaking I have mistook for something sinister! YEs, yes and yes! The imagination! You’ve said it all! That is one creepy photo! It looks like it’s reaching towards that little guy too. Haha. I LOVE THAT PHOTO! Mark has a real eye for photography! Thank you for visiting my blog. I found your site today and am excited to see your new stories in my reader! Thank you so much Estela! 🙂 Love your blog! Wow. Is that a thing? Whoooooa! you have just managed to creep me out.What country is that even, I never want to step there and if your theory is is right that some people can see ghosts while others can’t, I think I used to see ghosts then when I was a kid and no one believed me( kidding) and the picture of a guy and that strange apparition that creep me out as well..
That’s in Scotland, a place called Inverness! Noooooooo I always wanted to come to Scotland one day. but you said the creature doesn’t hurt or eat people right? Haha. According to Mark, you’re safe! But there’s still the danger of going nuts right? Yeah I know, but with me its a notch high(everybody I meet says that) so if I go more crazy then am done.. Interesting post. Creepy but interesting. That last photo is indeed scary. I hope you’re right and it’s just smoke. It gave me goosebumps! Mark has this way with stories! As of three hours ago there is an addition to this amazing story because Boleskine House is no more the house that it was. Today it has been burnt to the ground.